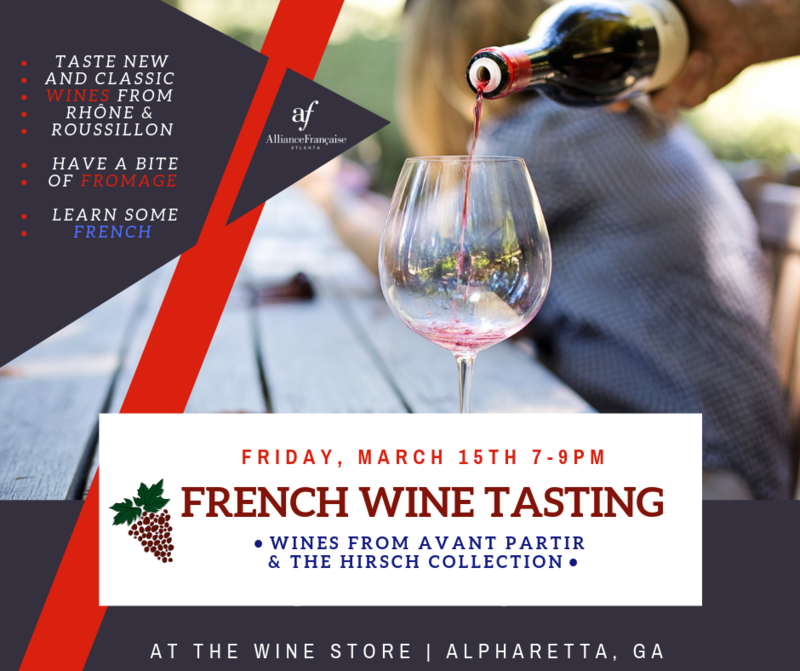 Come join Alliance Francaise for a French wine tasting with Avant Partir at The Wine Store’s Bin 75 Tasting Room in Alpharetta. Avant Partir and The Hirsch Collection will be pouring new and classic Rhône & Roussillon wines for you to taste, along with delicious artisan cheese from Cheeses & Mary. This event is in English, but Alliance Francaise will be standing by offering up French wine words to make you sound like a French sommelier! So whether you are a wine novice or connoisseur…. come join us! Taste some new wines, have a bite of fromage (of course)…and learn some French! We will raffle a beautiful bottle of Rhône Valley wine (2015 Domaine Brice Beaumont, Lirac Cuvee St Pierre aux Liens), your ticket automatically enters your name into the raffle! Click here to see the list of wines you will be tasting. Avant Partir imports estate grown true to the type wines that reflect their sense of place and craftmanship, and prefers to work with wine makers with pedigree. The Wine Store is North Fulton’s best source of fine wine OTP thanks to Keith, its long time knowledgeable and experienced manager. The Hirsch Collection represents winemakers who deliver exceptional quality wine with true expressions of region and terroir. Please RSVP and pay in advance to ensure a spot.